This Hudson’s Bay sale is valid today only, Friday, August 25, 2017 until 11:59pm EST. 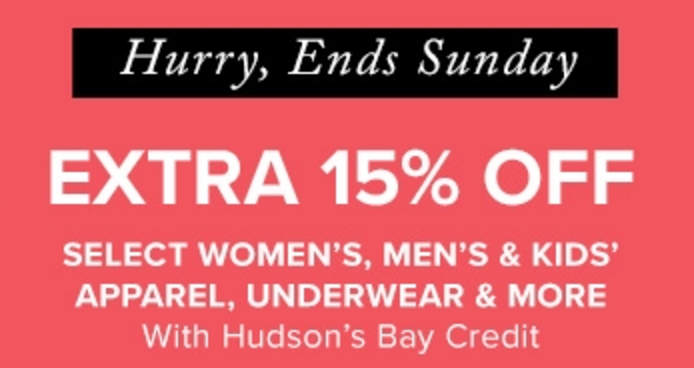 Also, Hudson’s Bay has an awesome weekend offer that includes Save an extra 15% off select Women’s Men’s & Kids’ apparel, underwear & more with Hudson’s Bay Credit card and using the promo code EXTER15 at checkout. This extra 15% off promo code is valid now until Sunday, August 27, 2017. Hudson’s Bay offers FREE shipping on orders that are $45+ (or $29+ on beauty purchases) when you pay with your Hudson’s Bay credit card, or $99+ (or $49+ on beauty purchases) when you pay with any other form of tender. Click here to begin shopping at Hudson’s Bay Canada.